Drivers - See your lap times as they happen! 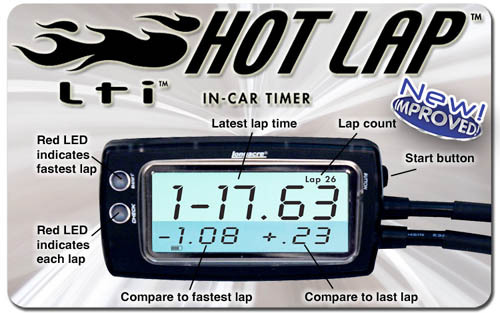 New Lti™ Hot Lap™ System works by sending an invisible IR signal from the transmitter across the track. When your car passes through the beam it is picked up by the receiver that is connected to the display, triggering the timing. The display shows your lap times as you race much more accurately than hand held stopwatches. You see your times on the track and you can try different driving styles or different lines to get the quickest times. Times are stored and can be recalled once you are back in the pits.